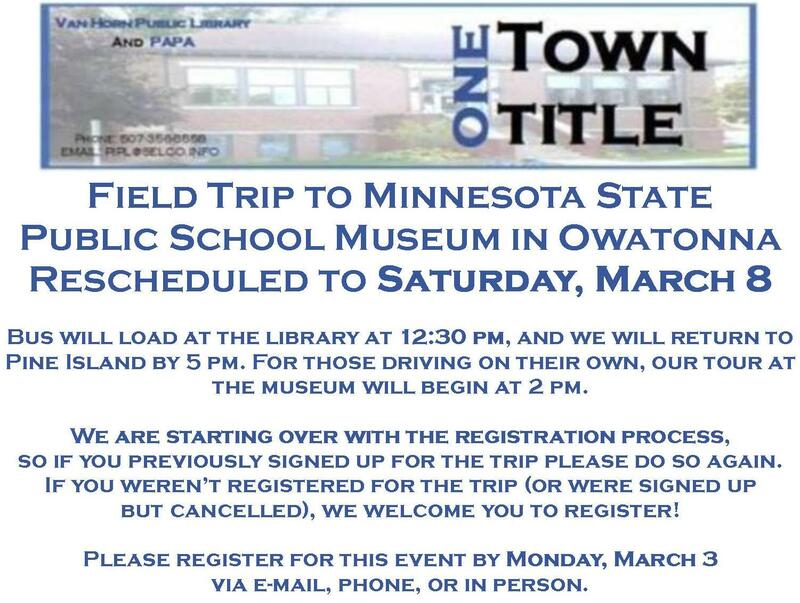 As the finale of Van Horn Public Library and the Pine Area People for the Arts’ fourth annual One Town, One Title event series, all area residents are invited to attend a discussion led by Olmsted County Parks Superintendent Tom Ryan on Tuesday, March 1st. Mr. Ryan and a special guest will guide us through a conversation about survival, natural history and creatures of the night. The event will take place at 7:00 p.m. at the Senior Citizen Center, 109 3rd St SW, Pine Island. Tom Ryan has been the Olmsted County Parks Superintendent since 2007. After obtaining degrees at the University of Minnesota Crookston and Winona State University, he spent 23 years as an Interpretive Naturalist/Outdoor Educator at Oxbow Park/Zollman Zoo and for 19 years was the director of that facility. A life-long reader, Ryan is an avid outdoorsman who enjoys birding, hiking, and camping. 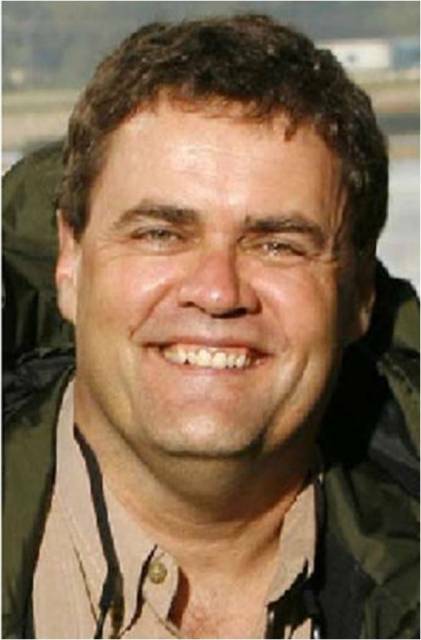 He was the outdoor columnist for Rochester Post-Bulletin from 1997-2007. As well as being a sportsman who enjoys hunting and fishing, he is a Firearms Safety Instructor and a recently retired Firefighter. 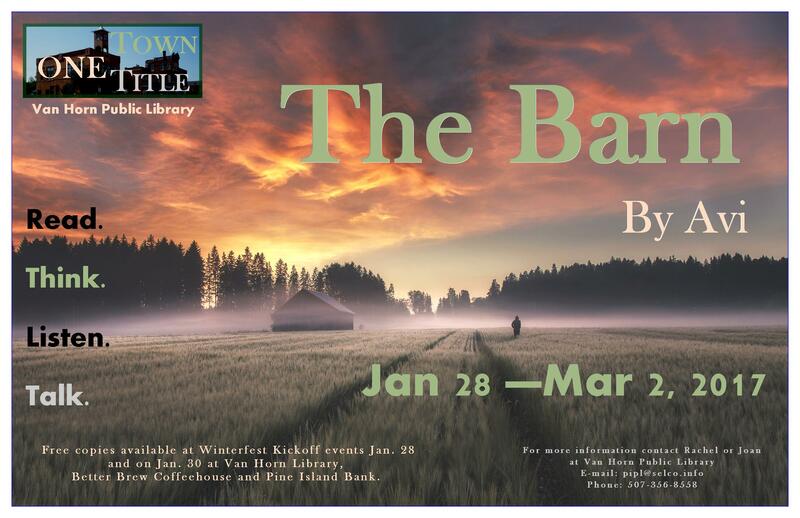 On Saturday, February 20th, there will be a free showing of the movie A Cry In The Wild at 2:00 p.m. as part of Van Horn Public Library and the Pine Area People for the Arts’ fourth annual One Town, One Title event series. All area residents are invited to attend. Free popcorn and beverages will be served! 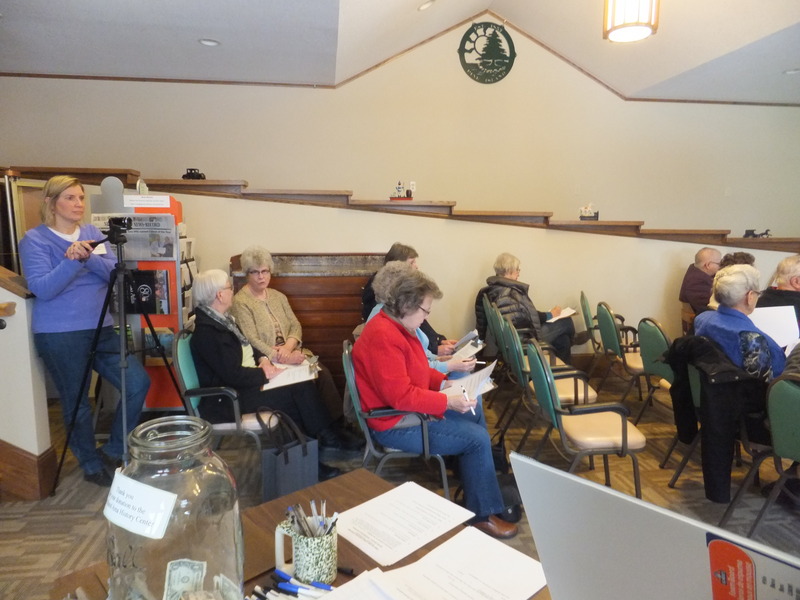 The film will be shown at Saint Paul Lutheran Church Fellowship Hall, 214 Third Street SW, Pine Island. The movie tells the story of thirteen year-old New Yorker Brian Robeson and his aborted trip to spend the summer with his father who works in the oil fields of Northern Canada since his divorce from Brian’s mother. Not long into the journey we see exhausted young Brian pulling himself from a remote Canadian lake. The tiny plane he managed to steer several miles after only a brief lesson lies under the icy water with its pilot dead of a heart attack. Somehow Brian has survived the crash. But gazing at the vast forest he can’t help wonder for how long. Equipped with nothing more than a hatchet and his ingenuity, he must learn to find food, shelter and a way to get home. Based on Gary Paulsen’s Newbery Award winning novel “Hatchet”, A Cry In The Wild is a family adventure at its most glorious and inspiring. Viewers can’t help but cheer on this plucky, inventive kid. 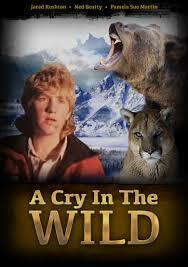 A Cry In The Wild is rated PG. There are some scary moments, so parents of very young children, please be advised. The book selection for One Town, One Title this year is Stephen King’s 1999 best seller The Girl Who Loved Tom Gordon. It tells the story of a young girl who becomes lost in the Maine woods. Free copies of the book are still available at Van Horn Public Library, Better Brew Coffeehouse and Pine Island Bank through March 1st. And don’t forget that the Finale on Tuesday, March 1st will be a discussion led by Olmsted County Parks Superintendent Tom Ryan. Mr. Ryan and a special guest will guide us through a conversation about survival, natural history and creatures of the night. The event will take place at 7:00pm at the Senior Citizen Center, 109 3rd St SW, Pine Island. There is no charge for the any of the events or for the books themselves and information about the events as well as a list of suggested discussion points will be included with each copy. One Town One Title 2016 is COMING SOON!! 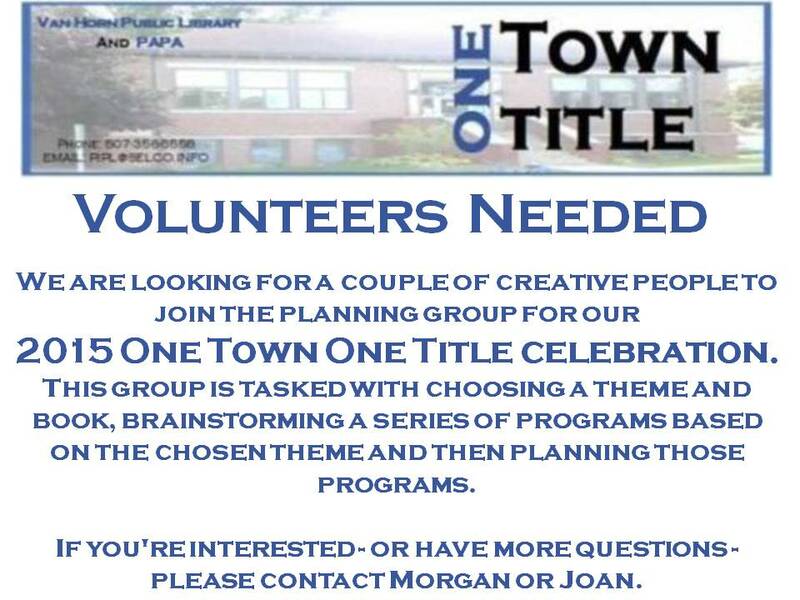 Van Horn Public Library in collaboration with the Pine Area People for the Arts (PAPA) invites all area residents to participate in the fourth annual One Town, One Title program from January 30 – March 1. The selection this year is Stephen King’s 1999 best seller The Girl Who Loved Tom Gordon. 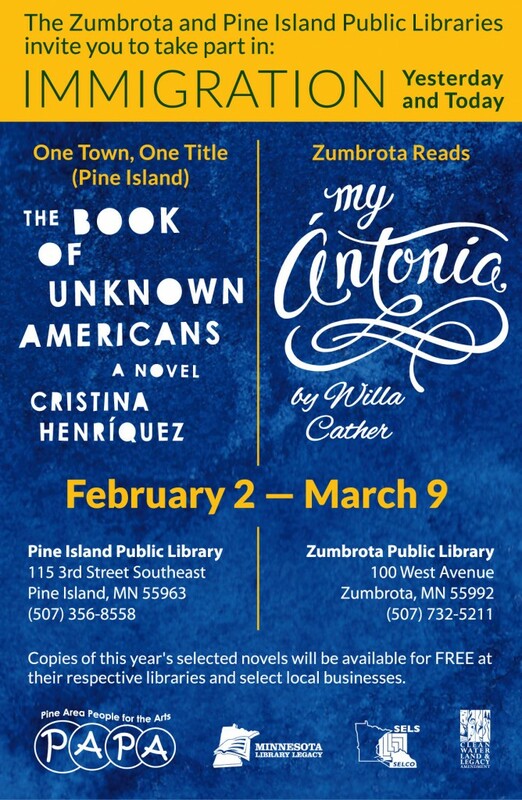 Free copies of the book will be available at several Winterfest events (details below) on January 30th and at Van Horn Public Library, Better Brew Coffeehouse and Pine Island Bank beginning February 1st. In The Girl Who Loved Tom Gordon, horror author extraordinaire Stephen King offers a psychologically suspenseful novel about a young girl who becomes lost in the Maine woods. On a six-mile hike on the Maine-New Hampshire branch of the Appalachian Trail, nine-year-old Trisha McFarland quickly tires of the constant bickering between her older brother, Pete, and her recently divorced mother. But when she wanders off by herself, and then tries to catch up by attempting a shortcut, she becomes hopelessly lost in a wilderness full of peril and terror. As night falls, Trisha has only her ingenuity as a defense against the elements, and only her courage and faith to withstand her mounting fears. For solace she tunes her Walkman to broadcasts of Boston Red Sox baseball games and follows the gritty performances of her hero, relief pitcher Tom Gordon. By the time her radio’s reception begins to fade, Trisha feverishly imagines that Tom Gordon is with her—protecting her from an all-too-real enemy who has left a trail of slaughtered animals and mangled trees in the dense, dark woods. One Town, One Title 2016 will kickoff January 30th as part of Pine Island’s Winterfest celebration. 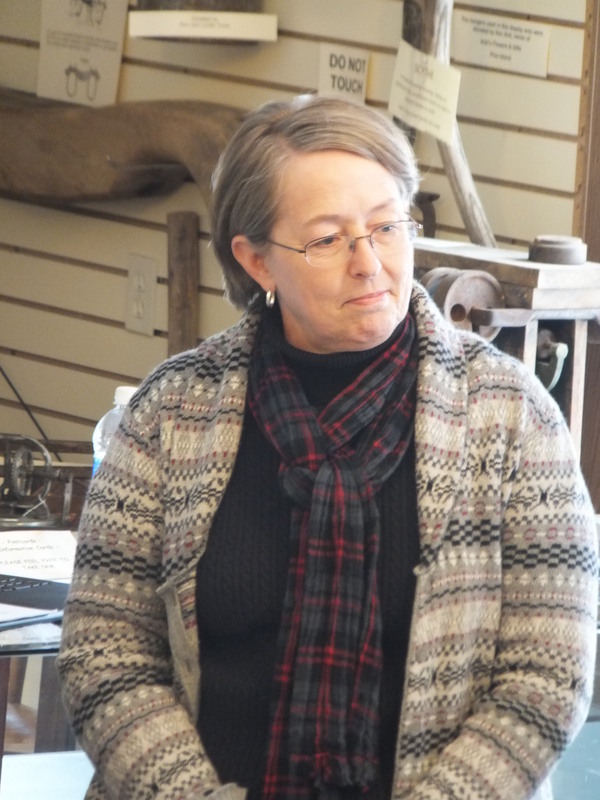 Pine Island Elementary School Teacher Mark Aarsvold and Van Horn Library Board Member Kim Aarsvold will conduct a Story Time at Better Brew Coffeehouse, 301 N. Main St. at 11:30am. Former Van Horn Librarian Jan Sween will be at the Pine Island Senior Citizen Center, 109 3rd St SW, at 12:45pm for a second Story Time. Both events are free and open to the public. 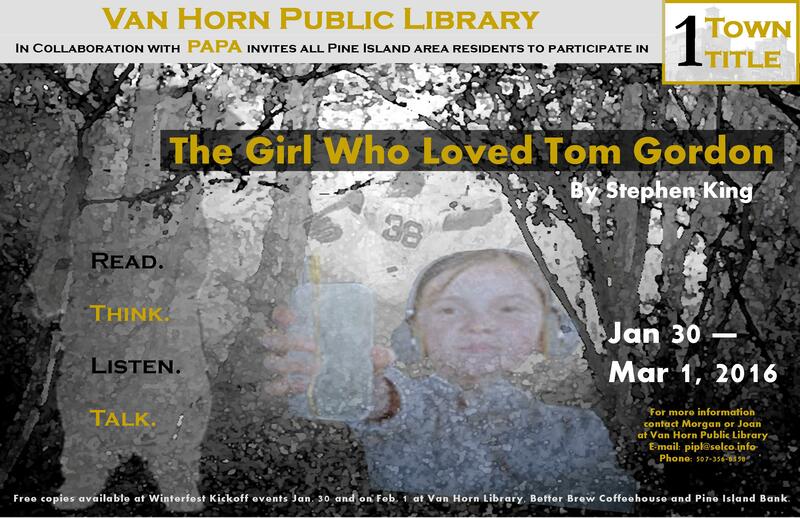 Free copies of The Girl Who Loved Tom Gordon will be available at both Story Times and at the Pine Island Golf Course Chili Feed from 5pm to 8pm. On Wednesday, February 17th the monthly Van Horn Book Club will be held at 6:00pm at Better Brew Coffeehouse, 301 N. Main St. As always, everyone is welcome to join the group for a cuppa and an informal chat about the book and the issues it brings up about courage, struggle and survival in the wild. Then on Saturday, February 20th at Saint Paul Lutheran Church Fellowship Hall, 214 Third Street SW, there will be a free showing of the movie A Cry In The Wild at 2:00pm. Free popcorn and beverages will be served! In the film, exhausted young Brian Robeson pulls himself from a remote Canadian lake. The tiny plane he managed to steer this far lies under the icy water with its pilot dead of a heart attack. Somehow Brian has survived. But gazing at the vast forest he can’t help wonder for how long. Equipped with nothing more than a hatchet and his ingenuity, he must learn to find food, shelter and a way to get home. Based on Gary Paulsen’s Newbery Award winning novel “Hatchet”, A Cry In The Wild is a family adventure at its most glorious and inspiring. And the Finale on Tuesday, March 1st will be a discussion led by Olmsted County Parks Superintendent Tom Ryan. Mr. Ryan and a special guest will guide us through a conversation about survival, natural history and creatures of the night. The event will take place at 7:00pm at the Senior Citizen Center, 109 3rd St SW, Pine Island. Please take a few minutes to complete this quick survey about this year’s One Town One Title / Zumbrota Reads series. and James Hill & Angie Gustafson from Zumbrota Public Library! We learned a lot of great stuff yesterday! 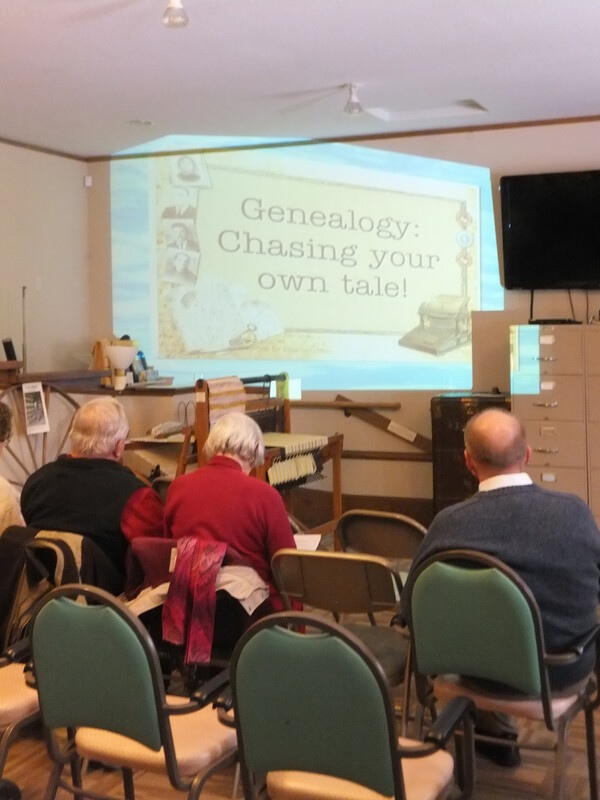 Many thanks to our presenter LeeAnn Cragin from the Family History Center for the wonderful program. 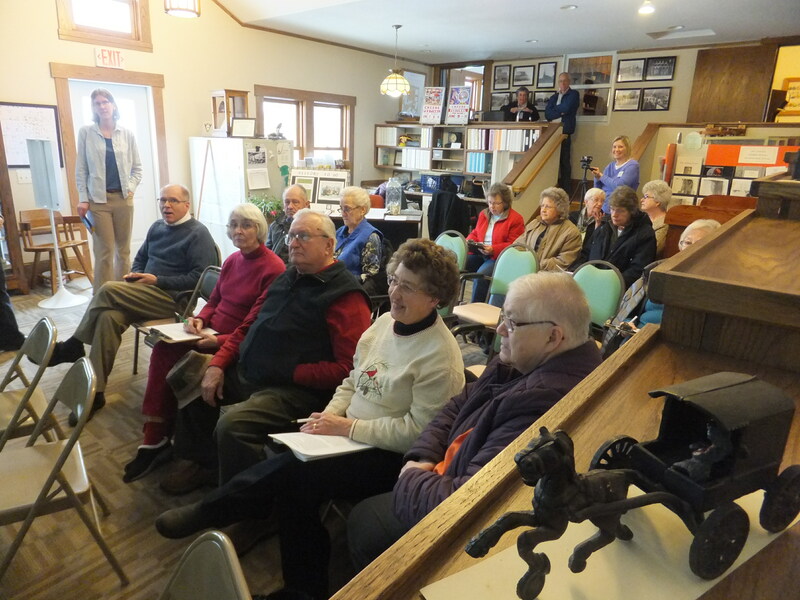 And a special thanks to our hosts at the Pine Island Area Historical Society.